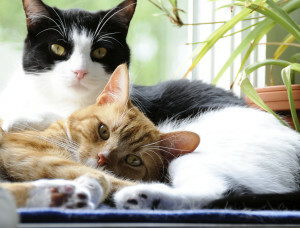 Which Litter is Best For Your Cat? Solving The Mystery – What’s the Problem? Spraying behaviors are not difficult to solve once the reason for the behavior has been identified, the stressful stimulus addressed or if possible, removed, and the soiled areas properly cleaned up. “Too many cats in the home, tension among the resident pets, or visiting animals can all trigger spraying behavior. Territory being threatened, or perceived to be is very stressful to the cat. Spraying urine is the cats way to mark and protect their territory. Environmental stress–such as moving into a new home–may also lead to a spraying problem. Anxiety caused by changes in work schedules, absences from home, spending less time with the pet, or inappropriate punishment may also cause a cat to spray in the home. When gathering information about the problem, close attention should be given to anything that might create a territorial response or make the pet anxious. Sometimes the stimuli for spraying are obvious. Other times, the provocation might not be as apparent, such as when the scent of another cat is brought into the home on a visitor’s clothing or your own. Treatment for controlling marking problems involves reducing the cat’s exposure to the stimuli that trigger marking and altering the cat’s response. 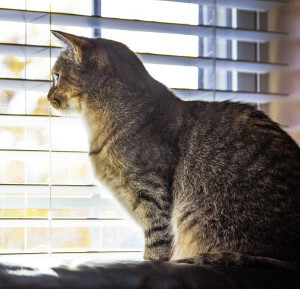 The cat’s opportunity to see outdoor cats should be stopped by closing drapes, modifying window sills, and moving furniture near windows where the pet perches. 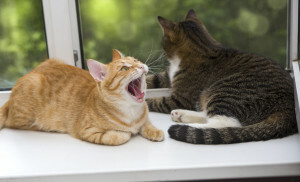 All evidence of urine odor should be cleaned from around doors and windows, indoors and outdoors…If tension between cats in the household is contributing to the problem, that issue should be addressed or the pets should be confined to separate areas in the home. In households with a large number of cats, the problem may not stop unless the number of cats is reduced. A new approach to the treatment of spraying problems is the use of Feliway, an environmental spray that consists of a synthetic chemical that mimics the scent found in the gland near the lips of cats (the facial pheromones). Feliway is sprayed directly on spots that have been previously sprayed by the cat and washed with oxiclean. When the cat returns to the area to freshen up his mark, he sniffs the Feliway and gets the message that this spot has already been marked facially, its time to relax and not stress out. Spraying behaviors can be an indication of various health problems. This possibility should be ruled out by a thorough examination by the veterinarian before a behavior modification is initiated. Although spraying is generally thought to be motivated by territorial anxiety, it can be also be caused by other types of stress, such as stress created by a poor litter box situation (e.g., dirty box, scented litter, bad location). The issue of proper litter box maintenance should always be addressed when dealing with a spraying problem.